The quote that I want to share today is taken from Essays on His Own Times, by Samuel Taylor Coleridge. I have frequently put it on my course syllabi, both now at Wheaton College and in years past at the University of Washington. I mean it to challenge, and in challenging, to inspire. I’m not confident that it has that effect (do my students read the syllabus? ), but it has definitely had that effect on me. The author of the quote was a British poet (author of “The Rime of the Ancient Mariner”) and essayist whose life spanned the close of the eighteenth century and the first decades of the nineteenth. I don’t know much about Coleridge, honestly. He is often remembered as one of the founders of the Romantic Movement in England, and T. S. Eliot evidently thought highly of his literary criticism. His personal life was troubled, however. He suffered extensively from anxiety and depression, and he struggled for decades with an addiction to opium. He at least briefly contemplated becoming a minister as a young man, but for much of his life his religious beliefs were closer to Transcendentalism than to orthodox Christianity. And yet God in His grace regularly grants partial insight to unbelievers, and we lose much when we limit our reading to those whose faith is identical to our own. The quote below, which I first came across in Russell Kirk’s The Conservative Mind, effectively conveys truths that we need to hear. In every state, not wholly barbarous, a philosophy, good or bad, there must be. However slightingly it may be the fashion to talk of speculation and theory, as opposed (sillily and nonsensically opposed) to practice, it would not be difficult to prove, that such as is the existing spirit of speculation, during any given period, such will be the spirit and tone of the religion, legislation, and morals, nay, even of the fine arts, the manners, and the fashions. Nor is this the less true, because the great majority of men live like bats in twilight, and know and feel the philosophy of their age only by its reflections and refractions. The prose is hard going, but there is a lot here if we’ll stick with it. I tell my students that there are three enormously important observations packed into this one paragraph, one in each sentence. First, every time and place is characterized by a predominant philosophy or way of looking at the world—answers to questions like Where do we come from? Why are we here? What is the basis of knowledge? How are we to treat one another? Second, that prevailing philosophy or world view is hardly limited to formal academic theorizing (“speculation”). Its spirit is everywhere: in law and literature, art and architecture, Facebook and fashions and every form of popular culture. Third, and most sobering, the philosophy of our age is something that most of us will absorb subconsciously rather than study systematically. Coleridge’s word picture here is powerful. Like bats guided by sound waves bouncing off of the terrain around them, we too can be guided by values that we feel more than see. This is one of the most compelling reasons why, as Christians, it is imperative that we study history. Studying other times and places will invariably introduce us to people who lived and thought differently. “The past is a foreign country,” British writer L.P. Hartley famously observed, “they do things differently there.” It is in grappling with these differences that the values we take for granted come into focus. “Do not let the world squeeze you into its mold,” Paul warned the church at Rome (Romans 12:2). Do we want to see the philosophy of our day more clearly? Or are we content to live “like bats in twilight”? I’ve shared three posts so far that aim at bringing us into conversation with Alexis de Tocqueville’s classic book, Democracy in America. You can expect one more lengthy post in this vein—the finale focused on some of Toqueville’s more troubling observations about the ostensible relationship of Christianity to American democracy. 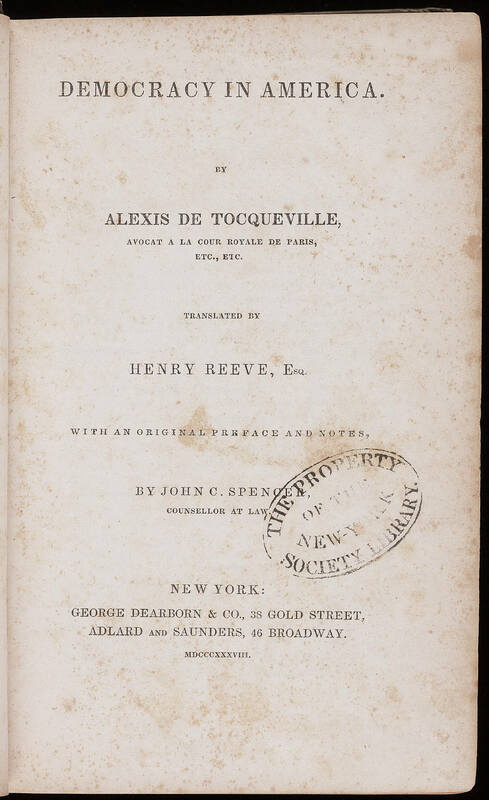 Before I get there, however, I wanted to take one more opportunity to pique your interest in this remarkable work, and to do so I thought I would simply share a couple of Tocqueville’s more striking predictions (made in the 1830s) about the future of America. Before I relate them, let me stop to note that predicting the future is not something historians are comfortable with. If it’s a glimpse into the future that you’re after—and you don’t have a crystal ball—you would do far better to consult a social scientist. Professional historians, when they are true to their craft, rarely are willing to make predictions about the future. Social scientists (political scientists and economists, for example), do this all the time. Why the difference? The difference is not primarily in the kind of evidence that they employ, nor is it the attention that they pay to the past. The key distinction lies in how they think about human behavior. Let’s compare economists and historians to make the point. Economists frequently look at historical evidence: data on trends in GNP, unemployment rates, consumer behavior, government spending, and the interrelationships between any and all of these. In this sense they are no different from historians. Their goal in consulting historical evidence, however, is to produce or refine a model—an overarching generalization—of how the economy functions. The simpler the model the more “elegant” it is. Aided by one or more theories of human behavior, the economist looks for patterns in how men and women act, individually and collectively, with the goal of identifying predominant tendencies that both explain what has been and project what will be. If Congress raises the minimum wage, what does the historical evidence suggest will be the impact on employment? If the Federal Reserve Board lowers the discount rate, what will be the effect on business investment and the overall impact on GDP? See the pattern? The past is prologue. What has happened helps to predict what will be. Historians, most of them anyway, believe that human behavior is far too complex to reduce to a few generalizations and think that social scientists tend to be guilty of oversimplification. This conviction, by the way, is why professional historians absolutely reject the (now) trite aphorism of the Spanish atheist Georges Santayana that “those who do not remember the past are condemned to repeat it.” We believe that human behavior is far more complicated than the mechanistic repetition that the quote, almost always taken out of context, seems to imply. Against the maxim (and the countless politicians and pundits who repeat it), we believe that the value of studying the past is not that it helps us to predict the future, but that it equips us to face it more wisely. There are echoes of both the historian and the social scientist in Tocqueville’s study of American democracy. Let me give you two examples. On the one hand, like the historian, Tocqueville paid great attention to the particularities of the American setting, and his precise descriptions of American values and institutions have been valued by scholars ever since. On the other hand, like the social scientist, he clearly hoped that his careful observations of democracy in the United States would lead to transferable insights about democracy in general. 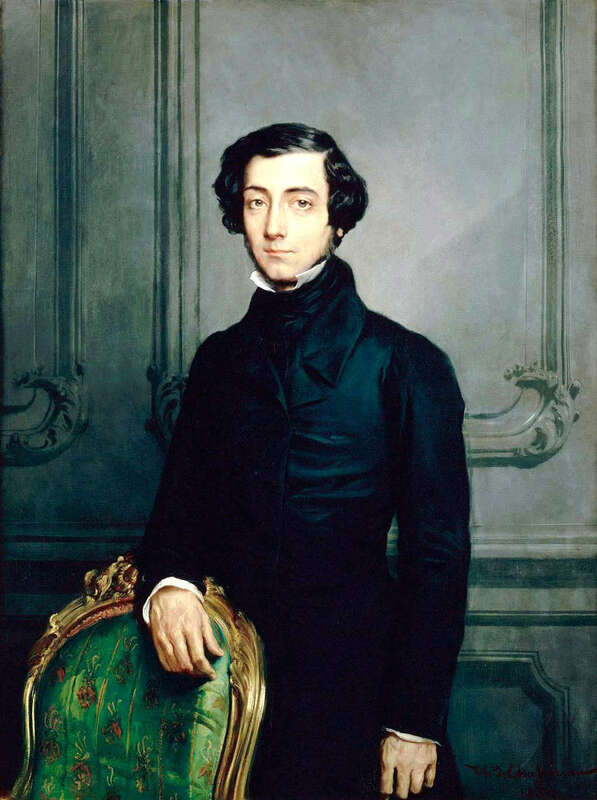 The first involves Tocqueville’s vision of America’s place in the future international balance of power. Writing in the 1830s, at a time when the U. S. Navy was miniscule, the young Frenchman predicted that the U. S. would “one day . . . become the leading naval power on the globe.” A century later that was true. Looking into the unknown, Tocqueville told his readers that the United States was destined to expand all the way to the Pacific Ocean, an event that transpired within a generation. Finally, he foretold that the day would come when the United States would be one of the two most powerful nations in the world. The other? Russia. “Their point of departure is different and their paths diverse,” he acknowledged. “Nevertheless, each seems called by some secret design of Providence one day to hold in its hands the destinies of half the world.” Can anyone say “Cold War”? Democratic ages are times of experiment, innovation, and adventure. There are always a lot of men engaged in some difficult or new undertaking which they pursue apart, unencumbered by assistants. Such men will freely admit the general principle that the power of the state should not interfere in private affairs, but as an exception, each one of them wants the state to help in the special matter with which he is preoccupied, and he wants to lead the government on to take action in his domain, though he would like to restrict it in every other direction. As a multitude of people, all at the same moment, take this particular view about a great variety of different purposes, the sphere of the central government insensibly spreads in every direction, although every individual wants to restrict it. In this way the simple fact of its continuing existence increases the attributes of power of a democratic government. Time works on its side, and every accident is to its profit; the passions of individuals, in spite of themselves, promote it; and one can say that the older a democratic society, the more centralized will its government be. I thought I would introduce a new feature on this blog that might interest some of you. I hope it will. I don’t know if you’re like me, but I know in advance that I will forget about 95 percent (99 percent?) of all that I read. This is why I take notes on just about everything that I read other than the newspaper. When I finish a history book, for example, I type out its central thesis, outline its argument, record the most important factual information it contains, and conclude with an overall evaluation of its strengths and weaknesses. All of this goes into my laptop, where I can readily access it as the need arises. She was so right. Since that time I have tried to follow Callie’s example, although I cannot match her prodigious pace. The journal is now one of my most prized possessions. It’s not for general information; it’s for gems—passages that affect me deeply in one way or another. And it has come to mean even more to me as I have come to realize that in keeping the quote journal I am perpetuating a centuries-old tradition. Beginning in the seventeenth century, if not before, it was common for students to keep what were then called “commonplace books,” journals in which they compiled quotations from what they were reading. Many of our nation’s founders kept such commonplace books throughout much of their lives. In the Library of Congress, for example, you can find an entire collection of commonplace books kept by prominent Americans. 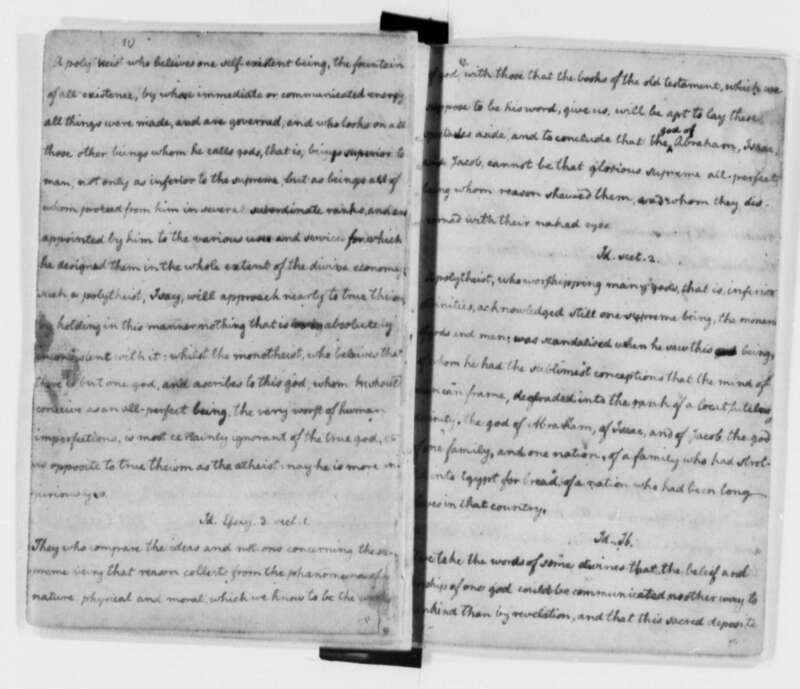 The image below shows a page from one of the commonplace books of Thomas Jefferson. Jefferson recorded passages from a wide array of books written not only in English, but in Latin and Greek as well. In the digital collections of the National Archives you can view an early commonplace book of John Adams, which Adams began while at Harvard and continued during his first job as a schoolteacher. In 1755, the twenty-year-old Adams recorded passages from a broad range of classical and contemporary works, from Roman poets to Puritan pastors. A page from Thomas Jefferson’s literary commonplace book. From time to time I plan on sharing with you from what I am now calling my commonplace book. Many of the passages I record are explicitly religious. There are Bible verses, prayers, lyrics from hymns and praise choruses, and quotes from Augustine, Calvin, John Henry Newman, G. K. Chesterton, C. S. Lewis, Dietrich Bonhoeffer and Stanley Hauerwas, among others. But there are at least as many entries from historians, philosophers, and educators, reflections that in some way or other help me to think through my calling as a Christian, historian, and teacher. 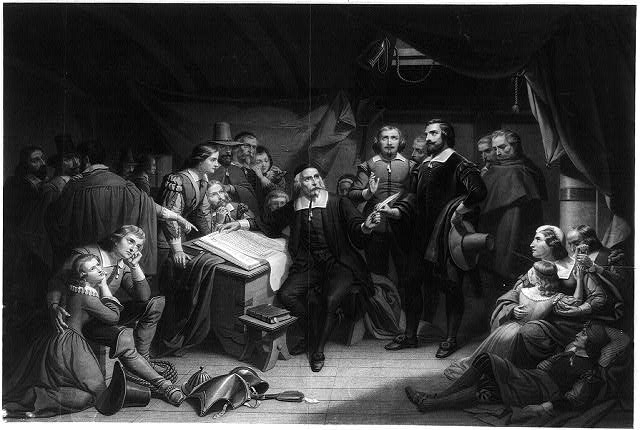 In keeping with the theme of this blog, I will tend to pick passages that shed light in some way on the broad terrain at the intersection of Christian faith, the life of the mind, and contemplation of American history. Just to get us started, and to keep this post from getting overly long, I thought I would begin with two very brief quotes from Alexis de Tocqueville, since we’ve been engaging with him quite a bit of late. Tocqueville’s work Democracy in America is so rich that I could share quotes from it for months and still not get to all the good ones. These are both quotes that I regularly include on course syllabi. In all my courses I unabashedly challenge my students to seek life-changing knowledge, and both of these quotes challenge is in this regard. We live in a sound-bite culture. We distil our world views into slogans, express our religious values on bumper stickers, develop our political philosophies on tweets. Our ever-dwindling attention spans demand simple answers to life’s questions, and heaven help the public figure who refuses to play along. As Christians, one of the most counter-cultural things we can do in contemporary America is to reject simplistic answers, even when they tell us things we wish were true. One may count on it that the majority of mankind will always stop short in one of these two conditions: they will either believe without knowing why or will not know precisely what to believe. But only a few persevering people will ever attain to that deliberate and self-justified type of conviction born of knowledge and springing up in the very midst of doubt. It’s a sobering assessment that should bring us to our knees. O Lord, save us from the prejudice of believing without knowing why. Deliver us from the doubt of not knowing what to believe. And in your mercy, grant us the perseverance in pursuit of truth that makes our doubt, not an enemy of conviction, but the seedbed from which it grows. The Wheaton College chapter of Phi Alpha Theta, the history honor society, had its induction of new members last week, and as its faculty sponsor I was invited ahead of time to speak at the ceremony. I was happy to comply. My instructions were simple: be brief, and “say something inspiring.” I’m not sure which is harder. If you doubt him, look up the Apostles’ Creed or the Nicene Creed and note just how many of their assertions are historical claims. The verbs are predominantly past tense: Christ “was conceived” by the Spirit, “was born” of the virgin, “suffered” under Pilate, “was crucified, died, and was buried,” “descended to hell,” “rose again from the dead,” “ascended to heaven.” Do you see the pattern? History is utterly central to Christianity. Its core doctrines rest on theological interpretations of historical events. 2) Just as particular historical events are foundational to our faith, our faith persuades us that the entire human story is worthy of attention. We believe that God has infused the human story with great dignity. To begin with, our understanding of creation tells us that God Himself set the story in motion and that its central characters bear His image. Next, our belief in the incarnation reminds us that the Lord of the Universe actually entered into the story, identifying with its characters and walking the earth as one of them. Beyond this, our conviction of God’s sovereignty teaches us that God is not only Creator but Sustainer as well. He is involved in the minutest details of the human story. It is an epic that is unfolding according to His design and decree. In this sense we should see the human past as a sphere that God has created—and thus a form of natural revelation—every bit as much as the physical world around us. 3) In striving to understand the past, we stand on holy ground. Human behavior is complex, the sum of all that humans have said and done and thought in the past is almost infinitely vast, and only a miniscule fraction of this immense expanse can be glimpsed in the flawed historical records that survive. C. S. Lewis captured this reality with a memorable metaphor. Noting that “a single second of lived time contains more than can be recorded,” he likened the past to “a roaring cataract of billions upon billions of such moments: any one of them too complex to grasp in its entirety, and the aggregate beyond all imagination.” But there is One, the Architect and Lord of history, who comprehends that incalculable expanse perfectly and exhaustively, and when we realize this it should cause us to drop to our knees and declare with the psalmist, “Such knowledge is too wonderful for me” (Psalm 139:6). Humanly speaking, the past is gone forever. We strive to reconstruct the merest fraction, relying on shadows and echoes to piece together glimpses of a vanished reality. And yet, as Link marveled to contemplate, a perfect record of the past “is stored in its incredible totality in the mind and memory of God.” Yes, we need to take off our shoes. 5) Historical perspective plays a vital role in faithful Christian discipleship. The scriptures warn us not to let the world “squeeze us into its mold” (Romans 12:2), and yet the attitudes and assumptions that shape us are so often invisible to us. This is particularly true of questions about which our own reference group has long been agreed. We see these accepted values as obvious and natural, and then eventually we cease to see them at all. The upshot is that, without even knowing it, we can live out our lives “like bats, but in twilight,” to borrow Samuel Taylor Coleridge’s haunting image, blindly guided by values that we feel more than see. We cannot study the past for long, however, without encountering peoples—including committed followers of Christ, not just non-Christians—who have looked at the world in ways that seem strange to us, even bizarre. Seen through their eyes, the cultural conventions that mold us come into sharper focus. Standing imaginatively in their shoes, it may actually become easier for us to pursue a heart of wisdom, for surely a vital component of Christian wisdom is seeing ourselves rightly. Our thinking can also be stretched, for as we discover that many of the truths we have viewed as self-evident were far from obvious to previous ages, we may be forced to think through, perhaps for the first time, the reasons that we hold them. This too is a blessing, for that is what “taking every thought captive in obedience to Christ” (II Corinthians 10:5) is all about. 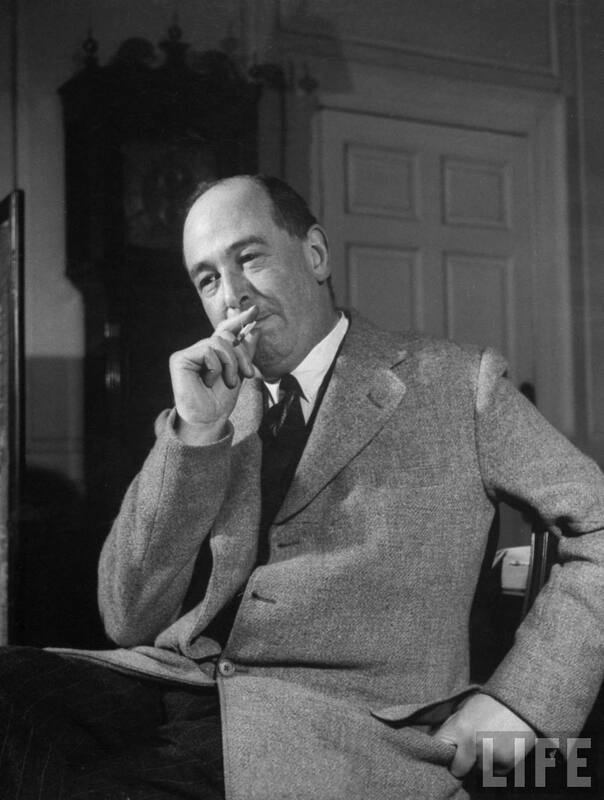 C. S. Lewis was one of the greatest Christian apologists of the twentieth century, and I have long appreciated many of his better known popular works. As a young adult, I read and re-read classics such as Mere Christianity, The Screwtape Letters, The Great Divorce, Miracles, and The Problem of Pain. Then when our children came along and they were old enough, my wife recommended that I read The Chronicles of Narnia to them. Soon Peter and Susan and Edmund and Lucy—not to mention a host of centaurs, dwarves, giants and dufflepuds—were part of our regular bedtime routine. Count me a fan. Although I never expected it when I first began to read Lewis, he has also helped me immensely in thinking about my calling as a historian and a teacher. 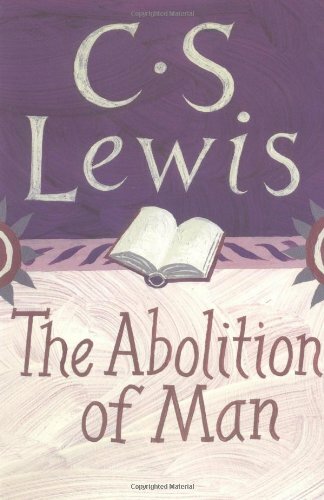 I was reminded of this recently in re-reading Lewis’s The Abolition of Man, a book that I was informally discussing with a small group of Wheaton undergraduates. If you don’t know the book, I highly recommend it, particularly if you are at all interested in the role that education plays in both affecting and reflecting popular values. It’s a short book (most editions come in at under one hundred pages), but it’s also a difficult book, the kind that you have to read slowly, and more than once, to get the maximum benefit. But isn’t that true of most books that change us, rather than merely entertain us? The Abolition of Man is a jeremiad, an extended warning. Lewis’s primary concern is to call attention to the disastrous long-term consequences of an educational philosophy that denigrates moral truth. Necessarily, it is mostly critical. Yet embedded in Lewis’s negative assessment are glimpses of a very different approach to education, glimpses that offer positive ideals to strive toward. Let me share a favorite example of what I have in mind. misunderstood the pressing educational need of the moment. They see the world around them swayed by emotional propaganda—they have learned from tradition that youth is sentimental—and they conclude that the best thing they can do is to fortify the minds of young people against emotion. My own experience as a teacher tells an opposite tale. For every one pupil who needs to be guarded from a weak excess of sensibility there are three who need to be awakened from the slumber of cold vulgarity. The task of the modern educator is not to cut down jungles but to irrigate deserts. I’ve found these two phrases—“cutting down jungles” and “irrigating deserts”—to be wonderfully useful metaphors. They have helped me to think more perceptively about the conventions of academic history, and they have enabled me to see more clearly how those conventions have influenced what I bring to the classroom. “Cutting down jungles,” as I understand that phrase, means helping students with passionate convictions to evaluate critically their world views, to examine what lies beneath the personal beliefs they profess. “Irrigating deserts,” conversely, involves nurturing in apathetic or cynical students the hope that there is meaning and purpose in human existence. We academic historians are great at cutting down jungles. Read almost any reflection on the historian’s vocation by an academic historian and you will come across statements like the following: “Basically history is destructive.” “The practice of history is not comforting” but “profoundly subversive.” “Honest history” will be “unsettling” and “jarring.” It pushes people “to stand outside their comfortable . . . assumptions and to learn unpleasant lessons.” Our “proper role” as historians is to “challenge preconceptions and assumptions,” “critique and reform unreflective modes of civic discourse about the past,” criticize “American cultural and societal failures,” “challeng[e] received wisdom,” “explode national myths.” Yep, we love to wield our machetes. But we’re a pretty sorry lot when it comes to irrigating deserts. Academic history is too often “all head and no heart,” in the words of distinguished historian Gordon Wood. Taking Lewis’s counsel seriously demands that we correct that imbalance. Historians need to recover a role that not only criticizes but encourages, that not only explodes myths, but also serves as the custodian of forgotten dreams for a better world. Yes, we must challenge the self-serving assumptions of the culture, but we must also boldly identify, in the words of David Harlan, “what is good” in our past, “what is worth insisting on and saving.” Figuring out how to do that is a challenge, but it is a goal worthy of our best efforts.